Prothoma is a Responsive Corporate Business Minimal WordPress Theme for agency, digital studios or web agencies. Quick and easy setup to create a portfolio and show your works and services. The Theme is optimized for smartphones and tablets, it provides a clear documentation and no coding knowledge is required. A stunning visual experience for minimal loving creative. This theme is responsive and retina-ready WordPress Theme with grid system layout. It is optimized for mobile touch and swipe. Responsive & Retina Ready â€“ Prothoma Theme looks good on desktop, tablets and smartphones. It provides the possibility to feel free on all screen sizes. Performance Matters â€“ Prothoma is a super fast theme. 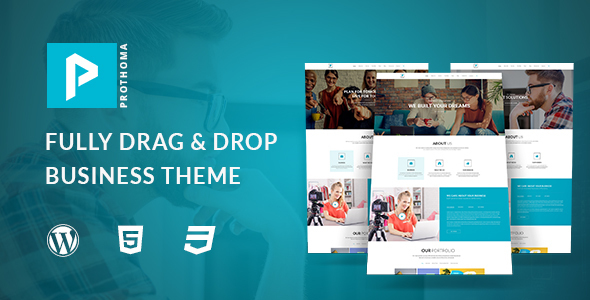 Drag & Drop Page Builder â€“ Prothoma Theme uses #1 WordPress Page Builder Plugin: Visual Composer. Build any layout you can imagine with intuitive drag and drop builder. No programming knowledge required. Powerful Options Panel â€“ Modify your site with few clicks in our user-friendly theme options panel. Setup Wizard â€“ It takes only 2 minutes to have your website like our demo. SEO Optimized â€“ Best practice to help you to get higher ranking in search engines. Automatic Theme Updates â€“ Donâ€™t waste more time with updating your theme manually.